Edinburgh Monarchs welcome Ipswich Witches to Armadale Stadium tonight seeking to win their fourth Premier League speedway fixture on the bounce. Despite the strong start Monarchs have made to the defence of their title, team manager Alex Harkess has dampened down suggestions the Capital outfit are poised to repeat the 24-match unbeaten run which blew away their rivals last season. Harkess emphasised Monarchs are not so dominant this year and said: “The team still go everywhere trying to win, but at this early stage you do not have the belief yet that you will win every single match. That only comes once you get past the first dozen or so matches. We have already lost two matches in the League Cup at Glasgow and Workington. We are not in the unprecedented situation of having a reserve (Stevie Worrall) this time who was unbeatable and was taking seven rides. Monarchs’ fine 50-40 victory at Scunthorpe Scorpions a fortnight convinced Harkess that some seeds have already been sown away from home, which is fertile ground in staking a claim for a top-six finish which opens the path to the play-offs. Yet Scunthorpe is not a circuit which finds favour with the Monarchs team. “That’s not changed, but they just got their heads down and got the job done. That meeting was all about who made the gate because it was very difficult to pass unless you were very brave. “One or two of our team did that. Scunthorpe have not made a good start to the league season so it was one of those places we felt we really had to come away with something. 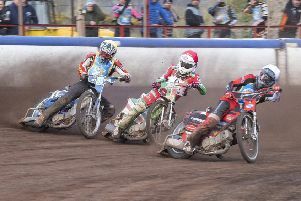 Ipswich collected their first league point of the new campaign at Newcastle Diamonds last Sunday after losing narrowly 48-43, however home and away losses against Sheffield Tigers a week earlier could still ultimately spell trouble for a side who have under-performed since dropping down from the Elite League. The Witches welcome back Gino Manzares, who has recovered from a fractured shoulder blade, but they suffered a fresh blow when Aussie star Cameron Heeps broke his wrist in their KO Cup first leg defeat at Berwick Bandits on Saturday, and they will use rider replacement to cover his absence. Meanwhile Monarchs star Justin Sedgmen, who was named this week in Australia’s Speedway World Cup squad, is hoping recent bike gremlins have finally been banished. But it seems as if Sedgmen is back on track after scoring ten points against Newcastle Diamonds at home last Friday, and he repeated that total 24 hours later guesting for Workington Comets in their victory over Plymouth Devils. It is also hoped Erik Riss will return to the Monarchs saddle after breaking his collarbone at Workington when a ‘high five’ with Sedgmen backfired.